This is an interesting image. I actually own several cels from the movie (a personal favorite). The most recent acquisition was a two cel setup from the musical number with a trio of swarthy characters. My setup has the three singers, and a cel with the top part of the "goods" to the right and the left. 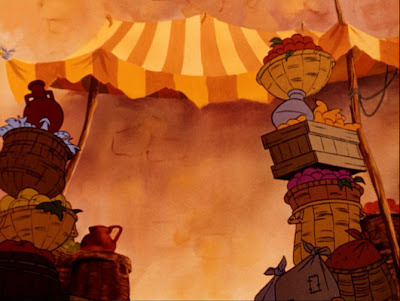 So it appears there was a background, a character layer, and two layers of cels with the "goods." Here's a look at the B/G with the characters digitally eliminated, the other cel elements intact.